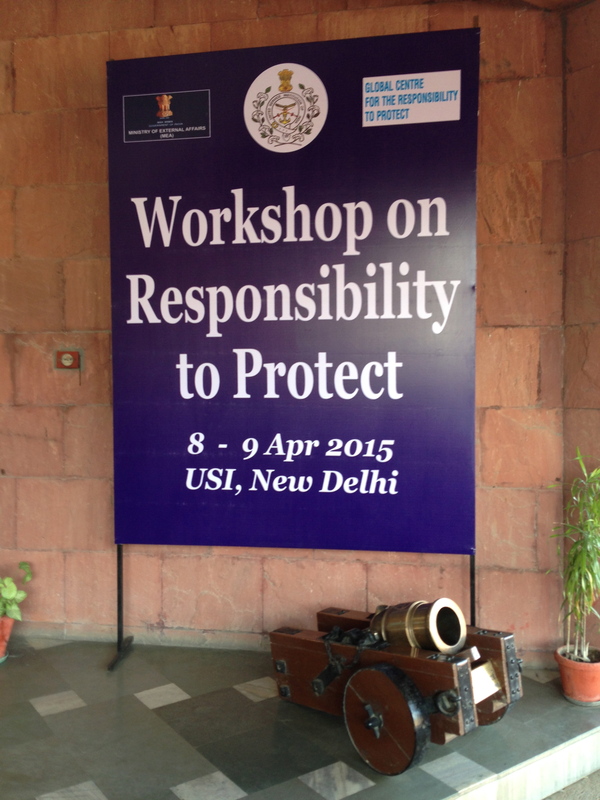 On 8 and 9 April 2015, the Ministry for External Affairs of the Republic of India (MEA), the United Service Institution of India (USI) and the Global Centre for the Responsibility to Protect co-hosted a two-day workshop in New Delhi, India, on the Responsibility to Protect (R2P). The conference, the first to be held on the sub-continent with regard to R2P, was an opportunity to have an informed conversation with key stakeholders (senior officials from the Ministry of External Affairs, Defense Ministry and other relevant ministries and departments, policy research institutes based in Delhi and relevant policy experts) about the context in which India engages in civilian protection and mass atrocity prevention in the multi-lateral fora. Over the course of the constructive discussion, issues relating to the UN Security Council reform, use of force and the future of UN peacekeeping operations were examined. At various points of the workshop senior MEA officials noted that India was deeply committed to protecting populations from mass atrocity crimes and that they will factor the recommendations raised during the conference into future policy planning. In addition, it was also stressed that this workshop was only the start of the conversation on R2P and that India was ready to engage nationally, regionally and internationally on the issue. The Global Centre's Director of Programs, Ms. Savita Pawnday, and Advocacy Officer, Mr. Ryan D'Souza, participated in the seminar. The workshop was formally opened by Lt Gen P K Singh, Director of the USI. He recalled that this was an important opportunity to have a timely discussion on how India should engage on R2P and advance efforts to protect civilians from mass atrocities. In his remarks, Mr. Shri Vinod Kumar, Additional Secretary at the Ministry of External Affairs, stressed India's commitment to protecting populations from genocide, war crimes, ethnic cleansing and crimes against humanity. He expressed the willingness of the MEA to engage on R2P by convening the workshop and to work closely with the Global Centre. Despite these positive comments, he noted that India still harbors reservations about NATO actions during the military intervention in Libya in 2011. He said that R2P must be implemented in accordance with the UN Charter and that armed intervention must be a last resort. In keeping with this theme, he recalled India's support for the Brazilian concept of 'Responsibility While Protecting'. He also outlined that India will continue to push for wider reform of the UN Security Council, including expansion of its membership. Ms. Savita Pawnday, Director of Programs at the Global Centre for the Responsibility to Protect, introduced the concept of the Responsibility to Protect as well as the work of the Global Centre. Ms. Pawnday also used her welcoming remarks to note the important role of India in civilian protection given that is the largest democratic society in the world, the third largest troop contributing country to UN Peace Operations and has contributed to efforts to protect civilians in Bangladesh and Sri Lanka. The second morning session looked at "R2P and Civilian Protection: Challenges and Opportunities." The discussion was chaired by Lt Gen P K Singh and panelists included Ambassador RS Kalha, former Secretary at MEA, Dr. Urvashi Aneja, Executive Director of the Centre for Global Governance and Policy and the O P Jindal Global University, and Ms. Savita Pawnday. During this session, Ms. Pawnday provided further evidence of the progress achieved thus far in developing the norm, while also outlining the key challenges that remain. Following lunch, the last panel of the day focused on "Peacekeeping, Protection of Civilians and R2P." The discussion was chaired by Professor Raja Mohan, Observer Research Foundation, and panelists included Lt Gen Chander Prakash, former Force Commander MONUSCO, Mr. Ryan D'Souza, the Global Centre and Dr. Ruchia Beri, IDSA. The aim of the conversation was to highlight the challenges for peacekeepers in protecting civilians and to identify strategies required to prevent mass atrocities. The second day of the workshop began with a discussion on the role of the IBSA countries: "India, Brazil, South Africa (IBSA): R2P and Global Responsibility". There was an understanding that as democracies there was a role for IBSA to play in shaping the discussion on civilian protection going forward. The panel, chaired by Ms. Savita Pawnday, included Ambassador BS Prakash, Former Ambassador of India to Brazil, Ambassador Duarte, the Brazilian Ambassador to India to India, Professor C S R Murthy, Jawaharlal Nehru University, and Mr. Nitin Gokhale, Defense and Security Alert. The panelists raised concerns around the use of force, particularly surrounding the interpretation of UNSC Resolution 1973. However, there was acknowledgement that the IBSA countries is different to the BRICS grouping given that they are pro-human rights and are not indifferent to mass atrocities. They agreed that they should play a role in shaping how R2P should be implemented in the future. In the closing ceremony, the joint-secretary of the foreign ministry said that they will factor the recommendations raised during the conference into future policy planning. He also mentioned that India was ready to engage nationally, regionally and internationally on R2P. This was in response to suggestions by multiple panelists and participants to hold regional workshops on R2P from a South Asian TCCs perspective. There was also a lot of interest on engaging within IBSA on R2P.